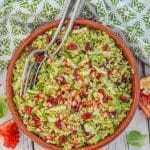 This Cranberry Pecan Brussels Sprout Salad is fresh & absolutely packed with flavour & interesting textures. It’s also hearty & warming thanks to the orangey cinnamon dressing. Just perfect for all of your fall & winter entertaining! 90g / ¾ slightly heaping cup pecan nuts , walnuts make a good sub. 5 pecan nuts , walnuts make a good sub. For a nut-free option see recipe notes. Wash the Brussels sprouts, removing any old leaves and the stubby bit of stalk. Shred the Brussels sprouts as finely as you can and put them into a large bowl. I use a food processor to do this as it makes it so quick and easy. Chop the nuts into small pieces and add them too along with the dried cranberries. Blend the dressing ingredients together until completely smooth. If you prefer a slightly thinner dressing just add a few drops of water until you get to the consistency you like. Pour the dressing over the salad and toss to distribute evenly. Sprinkle with a few extra cranberries and pecans if you wish and also some optional pomegranate arils too if you have them. I don’t recommend you buy pre-sliced Brussel’s sprouts for this salad. They are generally cut quite thickly and having thin slices really makes a difference to flavour and eatability. Pre-chopped veggies also are often a bit dry and withered around the edges. Fresh is best and will pay dividends in flavour, texture and appearance. This salad will keep well for a couple of days in the fridge once dressed. The sliced sprouts don't go slimy like lettuce does. If you are storing it though I would advise leaving the chopped nuts out until just before you serve to keep them nice and crunchy. This salad can easily be made nut-free. Just omit the nuts from the dressing. It is still really good without them. And in the salad you can either omit the nuts completely or use some pumpkin seeds or sunflower seeds instead.